I-7 (1943) The 355 foot Japanese submarine I-7 was sunk in a confrontation with several U S vessels June 23, 1943 in the vicinity of Twin Rocks near Kiska Island. The vessel was scuttled in 10 fathoms of water. Six crewmembers were killed in the initial attack and 43 others reached shore as the submarine went down. The I-7 had a compliment of 100 officers and crew. I-9 (1943) The 367 foot Japanese submarine I-9 was sunk with all hands by the U S Navy destroyer Frasier June 14, 1943 approximately 15 miles east of Sirius Point on Kiska Island. The I-9 carried a compliment of 114 officers and crew. I-24 (1943) The 358 foot Japanese submarine I-24 was sunk in a confrontation with the U S Picket Boat PC-487 June 10, 1943 approximately 40 miles north northeast of Shemya Island. The I-24 had a compliment of 104 officers and crew, all lost. I-31 (1943) The 350 foot Japanese submarine I-31 was sunk in 1,000 fathoms of water in a coordinated attack by U S aircraft and ships May 14, 1943 five miles northeast of Chichagof Harbor, Attu Island. The I-31 carried a compliment of 101 officers and crew. ICY MIST (2009) The 58 foot fishing vessel Icy Mist ran up on the rocks February 25, 2009 on the northwest shore of Akutan Island a half mile from Hog and Unalaska Islands. The vessel began taking on water in the engine room in heavy weather. Winds were gusting to 120 miles an hour when the crew of four abandoned ship to the beach nearby. They were rescued by a U S Coast Guard Helicopter and returned to Dutch Harbor. ILLUSION (2007) The 42 foot fishing vessel Illusion foundered February 10, 2007 in Makushin Bay on Unalaska Island. The vessel had been engaged in Pacific Cod fishing and was enroute to Dutch Harbor when she sank stern first and rolled to port. Winds were at 40 to 50 knots gusting to 60 when a U S Coast Guard Helicopter rescued the crew of four from a life raft. For his efforts in the rescue, Petty Officer 1st Class Will Milan was later presented the Coast Guard Foundation Individual Award for Heroism and the Coast Guard Meritorious Service Medal. INTREPID (1984) The fishing vessel Intrepid was blown onto the rocks and lost December 5, 1984 near Seguam Pass 130 miles southwest of Dutch Harbor. All five crewmembers were rescued by nearby fishing vessels. 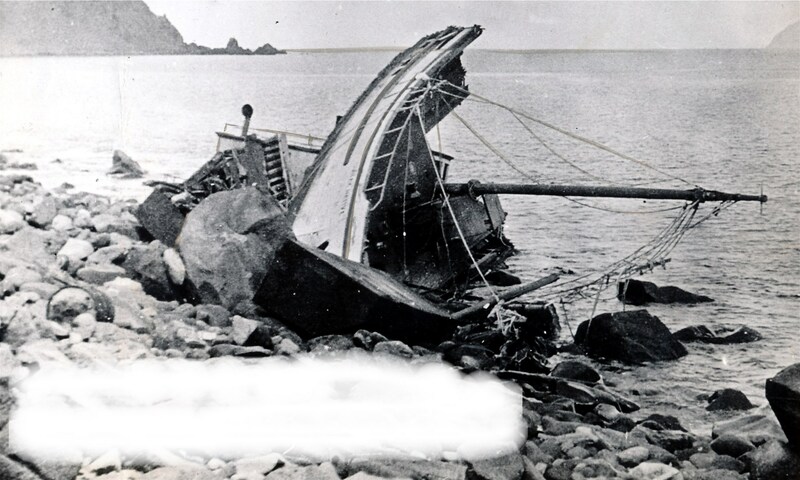 The Umnak Native was dispatched from Atka and rescued the survivors from Wide Bay where they had beached in dories. The passengers and crew camped overnight in the deep snow using the overturned dories for shelter.